I absolutely love egg rolls and at times, I worry about what might be in the egg rolls you purchase at the store. I really prefer to make things homemade when I can but I have to admit, I was a little intimidated by egg rolls. They just seem very particular and easy to ruin. However, this recipe was my first attempt and they came out WONDERFUL! Even my picky husband complimented these homemade egg rolls. I was rather shocked that these were so easy to make and taste amazing. I won’t buy store bought ever again I can tell you that! The original recipe calls for pork to make these pork egg rolls. I prefer vegetable egg rolls or chicken. Since I didn’t have chicken at this point, I went with vegetable egg rolls so I omitted the information for including the ground pork. You can find that here. I began by heating up a small amount of oil in a large skillet. 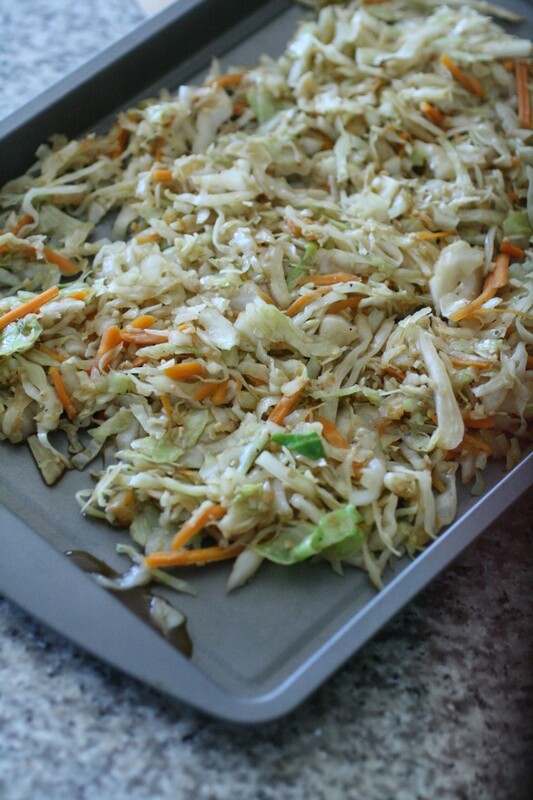 Once hot, I put in my garlic and coleslaw mix, and ginger. To make things easier, I used the coleslaw mix from the produce department that had shredded cabbage and shredded carrots. This made the dish much easier and didn’t change the taste at all. Saute this mixture for about a minute. Add in the rice wine, soy sauce, sugar, sesame oil, and black pepper. Continue cooking for another minute and then remove from heat. Place the mixture on a baking sheet and then tilt one side up so that the liquid will run down to the bottom away from the cabbage mixture. This is extremely important because you want the cabbage ingredients to be dry and cool before you make your egg rolls. Once the cabbage mixture is cool, I took a paper towel and just made sure the mix was as dry as I could get it. I started with an egg roll wrapper and placed approximately 1 TBSP of the mixture on the egg roll wrapper. Begin to roll until 1/2 way and then fold in the sides like an envelope. 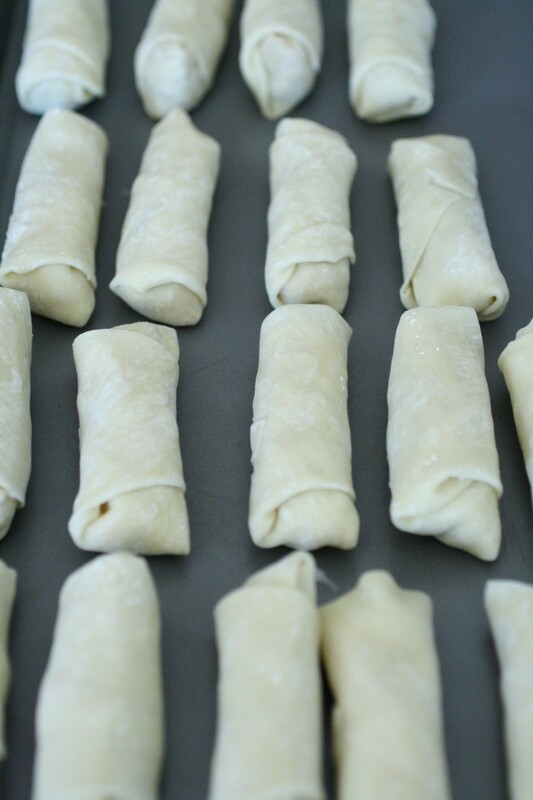 Make sure you are rolling tightly and once you fold in the sides, tuck and roll until you have the egg roll wrapper rolled all the way. Moisten the edge with some cornstarch/water mixture to seal it and place the egg rolls on a baking sheet until ready to fry. The original author recommends keeping the wrappers as well as the rolled up egg rolls moist by using plastic wrap. I would suggest that if you are in a dry environment/climate. I didn’t seem to have a problem not doing that here due to humidity. I also used organic egg roll wrappers that I found in the refrigerated section of the grocery store. I didn’t have an option of frozen ones as suggested by the original author. They came out perfect! Once all the egg rolls are made, heat up about 2 inches of oil in a saucepan. Once it is hot, gently put your egg rolls in the oil in batches. Make sure to turn them with a fork to make sure all sides are browned and don’t burn. Fry until a nice shade of brown, about 1-2 minutes. 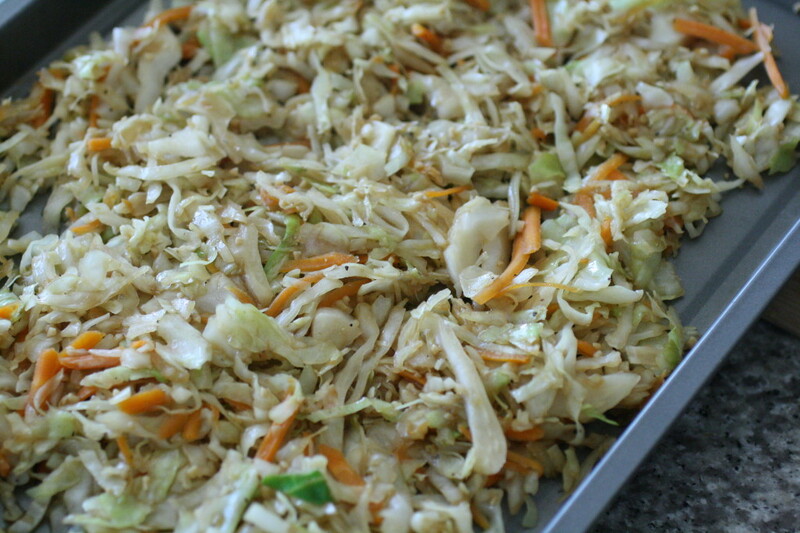 Remove the egg rolls and place on a cooling rack that has been placed on top of a baking sheet. This allows the egg rolls to drain. Serve with your favorite sauce! 1. Heat a wok or large saute pan over high heat. Add some cooking oil. 2. 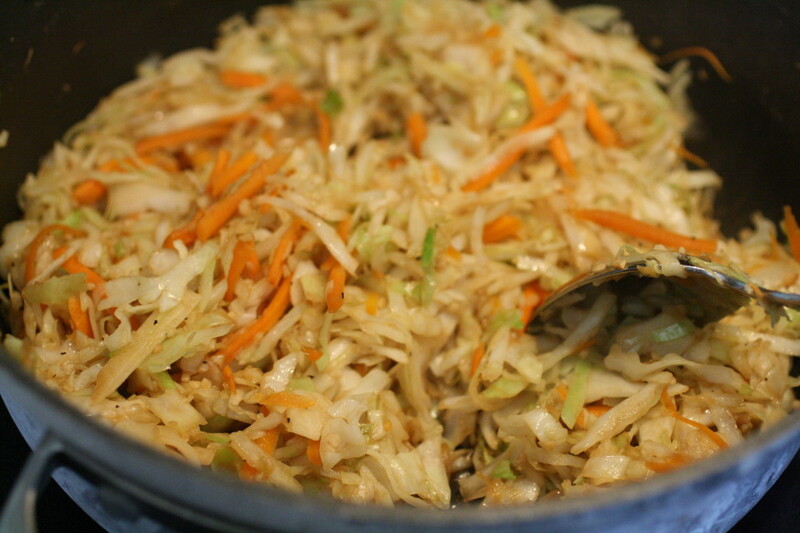 Add the garlic, cabbage, carrots, ginger, and mushrooms and stir-fry for 1 minute or until vegetables are softened. 3. Add the rice wine, soy sauce, sugar, sesame oil, salt/pepper. Continue to stir-fry for another minute. 4. Remove the filling and place on a baking sheet tray in a thin layer to cool. Raise one end of the tray to allow for the liquids to drain away from the filling. 5. Fill 1 Tbsp of filling for each egg roll. 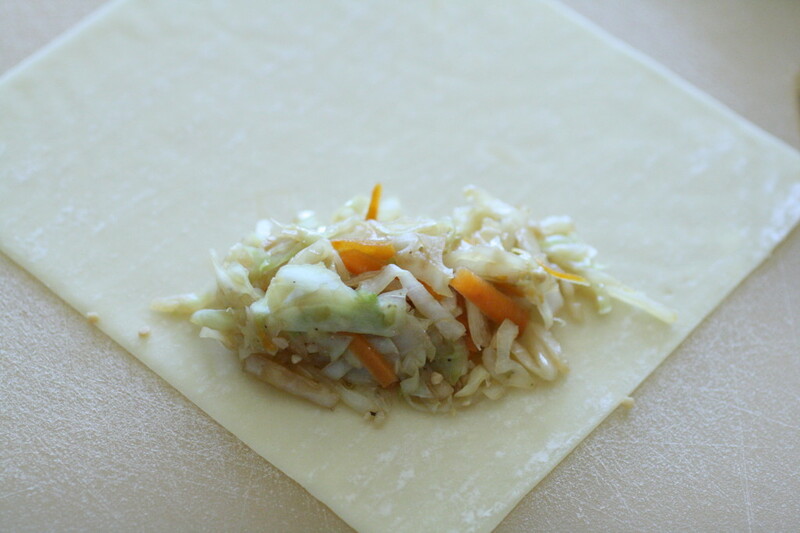 Roll the egg roll, making sure you are rolling tightly. Use the cornstarch and cool water mixture to seal each egg roll. 6. Heat up about 2 inches of oil in a sauce pan. 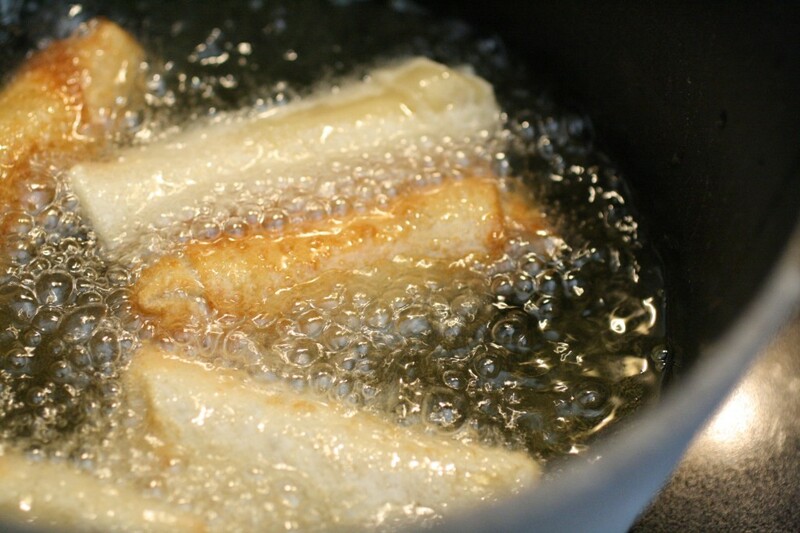 When the oil is hot, place the egg rolls in the hot oil carefully and fry in batches. Fry until golden brown, a minute or two max. 7. Remove the egg rolls and place on a cooling rack over a baking sheet to let drain and cool slightly. Super delish! and you could customize your ingredients too! Stop by our Snickerdoodle Sunday if you get time! You always make me hungry with your tasty recipes and we just had dinner. 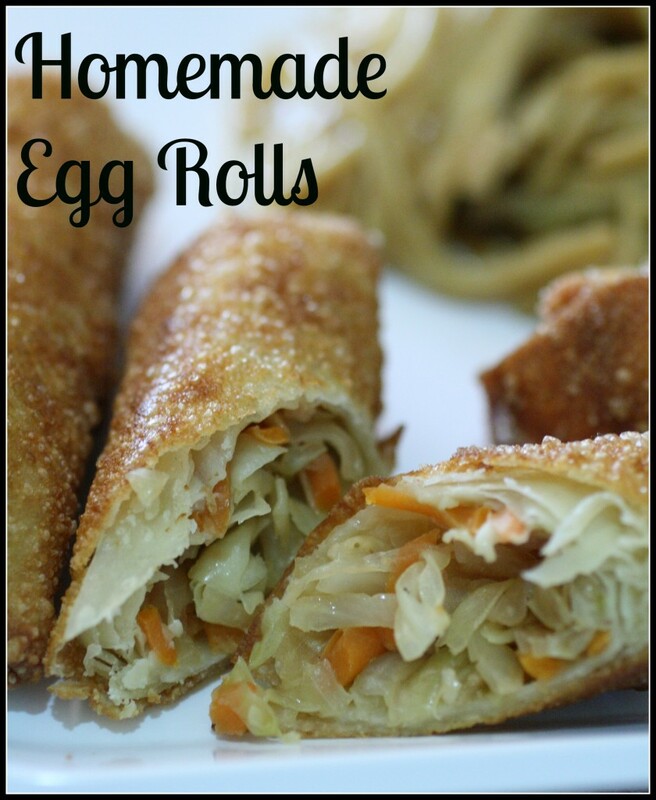 I haven’t tried making egg rolls but these look great. Thanks for sharing with #SmallVictoriesSundaylinky and being a great co-host these past couple weeks! Pinning to our Small Victories Sunday linky board and my recipes to try board. Am making the egg rolls now hope as good as they look ! These look great! Did you make the wrappers? Is that something you purchase already made? I’d love to give these a try! Thanks! I actually purchased the wrappers at the grocery store. I used ones in the organic section and it has about 24 wrappers per pack. I hope that helps! Oh, yummy! My family LOVES eggrolls. I’m going to have to make some now! 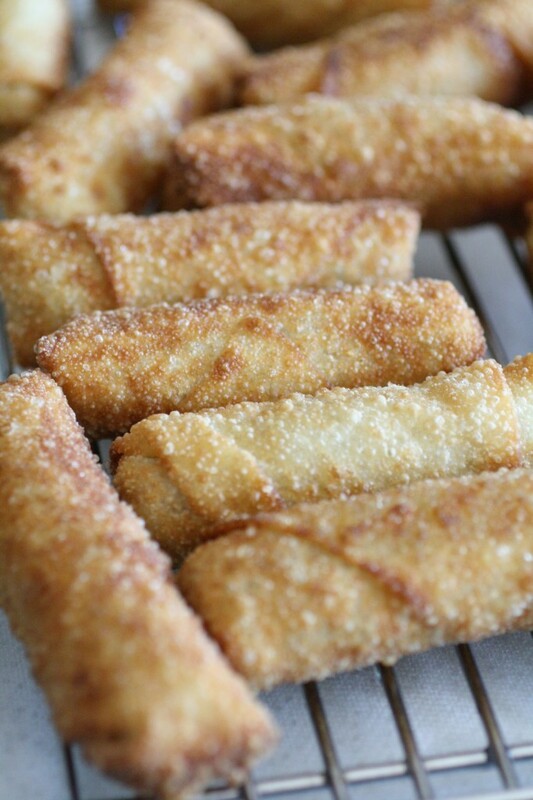 These eggrolls look very easy to make. The step by step instructions make them look easy to make. Thanks for linking up at the Ultimate Linky Party. Thank you for stopping by Michelle! They are so easy to make. I couldn’t believe it and now I will be making them all the time. I made up a batch and froze them this past weekend. excellent tip on colesaw mix. I plan to bake mine and add shredded chicken. These look delicious!! How many did they made? Thanks! It made an entire package of egg roll wrappers, so I want to say 20. Made these and the family loved them! Can you freeze extras? If so, how do I prepare from frozen? Hi Jennifer! Glad you and your family loved them. I have frozen them after already being cooked and then heated them up in a toaster oven. They aren’t as good as fresh, but they are better than store bought! 🙂 I hope this helps! Thanks for the recipe and responded to everyone’s comments. I would try baking them at 400˚ and start checking them for doneness around 15 minutes. I haven’t baked them personally so this is just where I would start. My Thai sister-in-law recommends dredging the uncooked egg rolls in cornstarch and freezing in zip bags (as much air out as possible). The cornstarch keeps them from sticking together and doesn’t affect the frying when thawed. Works like a charm! Since my large family loves them so much I never make less than 75 or 100 at a time so I always have ’em on hand. Great after school snack. I just made these and they were a hit! Really good. Thanks for a great recipe! Wanted to let you know that twice today when I went to your website a weird popup came up signing people up for a 1000 gift card, thought it might be some code that’s hijacked your site. Maybe not, I just worry about those things on my site and thought you might want to know. Thanks again great egg roll recipe! Just made these today. Love them. Used the cole slaw pkg as recommended; added chopped shrimp. They were delicious and easy. Definitely a keeper. I make these a lot. Tried frying them, but it made such a mess. Now I brush them with olive oil and bake them at 400 degrees until golden brown. Much less mess, and they are delicious. Any substitute for mushrooms? My family is not a fan of them! I drain the cooked egg rolls standing them upright in a colander lined with paper towels. They never get soggy. I’ve made this several times and my family can’t get enough! I made these today, they were terrific. Thank you for the recipe. Have no depth perception, so I dare not fry anything. Would it work just as well if I baked them? They sound very good!! Almost the same as how I make mine minus the garlic, mushrooms, rice wine, sugar, salt & pepper and I add onion. I also do not precook my veggies for I like the veggies to be a bit firmer. I do process the slaw mix, carrots and onion in my processor to break them down a bit but do not precook them. We also like them with a pound of browned sausage (we like Bob Evans breakfast sausage)mixed in as well. Yummo!